Why is real estate marketing not working for so many on social media? 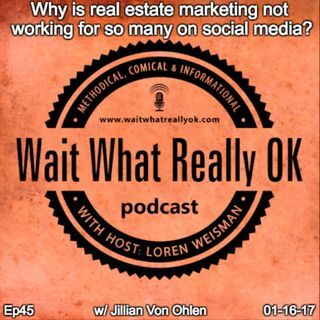 Wait What Really OK Podcast Episode 45 hosted by Brand Precision Marketing Strategist and Counselor, Loren Weisman talks with Jillian Von Ohlen about the problems with conversions when it comes to real estate marketing online and on social media. In this episode, we discuss common issues as well as present strategies and approaches that can be used to stand out and compound for conversions instead of push ... Más informaciones people away. Podcast Blog Supplement for Episode 45 of the Wait What Really OK Podcast with Loren Weisman. Podcast Link Supplement for Episode 45 of the Wait What Really OK Podcast with Loren Weisman. How do you know if a real estate agent is being honest with you? Podcast Video Supplement for Episode 45 of the Wait What Really OK Podcast with Loren Weisman. Podcast Photo Supplement for Episode 45 of the Wait What Really OK Podcast with Loren Weisman.